A frolicking romp through the zany world of nonsense verse. 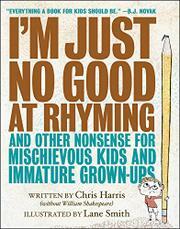 In the storied tradition of Nash, Lear, and Dr. Seuss, Harris joins forces with Smith to present over 100 original poems and illustrations dedicated to having some serious fun. Visual, aural, and downright guffaw-inspiring puns and riddles abound in this wildly imaginative and cleverly illustrated debut collection. Harris and Smith unite to preach the gospel of irreverence, daring children to explore and test parental—and poetic—limits in a variety of circumstances, whether through typography, illustration, or verse. In “Toasted Knight for Lunch Again?” Smith’s vividly textured multimedia double-page spread features Mama Dragon and Baby in conversation, as Baby points to lifeless Sir Gustav laid out on a plate, the feathery plume in his helmet serving as garnish, and whines, “No armor, Mom— / I want him / With the crust off!” In “ ’Tis Better,” Harris cheekily weighs in on the virtues of giving versus receiving, stating: “If that thing’s a black eye… / Then yeah, I believe it!” Harris and Smith even extend their banter to each other, Harris going so far as to bluntly state, “I Don’t Like My Illustrator,” and then Smith exacting revenge with a portrait of a snaggle-toothed, hairy-eared Harris with snot dripping from his nose.